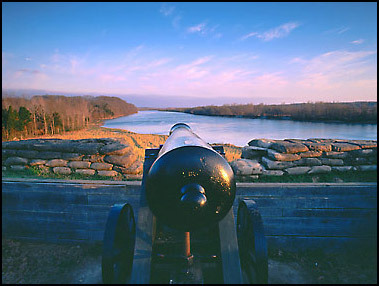 Fort Donelson was built in 1861 to defend the river approach to Middle Tennessee. It came under seige in February 1862, by a joint army-navy force under the command of General U.S. Grant, a relative unknown at this time. Lack of cohesion among the Confederate Generals led to their surrender after a three day battle, sending 12,000 to 15,000 troops upriver to Union prison camps.